Note from the Battery Rooftop Gardener: Crown Bees, which bills itself as the “The Gentle Bee Company,” is a solitary bee (mason and leafcutters) company based in Woodinville, WA that advocates using managed native bees for pollinating fruits and vegetables (see www.crownbees.com ). I invited Demarus Sandlin of Crown Bees to explain the potential of native bees for urban farmers. Her guest blog follows. Urban gardens face a host of special problems: space restrictions, sunlight availability, water sources, and excessive heat. Pollination is perhaps the most fundamental issue of all for those of us who grow food. Should we also raise honey bees or just hope that local wild bees will visit our plants? Mason bee on almond flower. Photo by Derek Artz. Honey bees are sophisticated pollinators but they have their drawbacks. Originally imported mainly for honey production, they arrived to the Americas from Europe in the early 1600’s. By WWII, honey bees were viewed as farmland’s principal pollinators. But the natural pollinators of our farms have always been our native bees. North America is home to 3,600 species of native bees. About 90% of these bees are solitary, which means they do not form hives. Instead, each female builds her own nest. Solitary bees are gentle and do not aggressively defend their nests. Many native bee species nest in the ground, the rest in empty stems or holes. Mason bees and leafcutter bees are native hole-nesting bees that are now being increasingly used by farmers and gardeners as pollinators. These native species should be preferred for many good reasons. A diversity of bees doubles or triples food production and an introduction of bees in a location without managed bees increases yields by 25%. This is because our native bees, which carry pollen dry on their abdomens (a larger surface area than the leg pouches that honey bees use), are about 30% more efficient at pollination than honey bees. 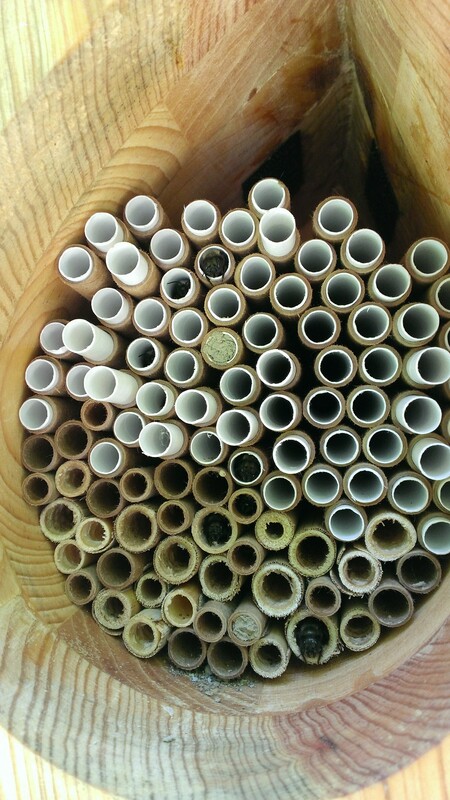 Hole-nesting bees can be easily moved where needed because they over-winter in cocoons either as larvae or young adults. In the spring or summer, simply place their cocoons in a new nesting house and they emerge, returning to lay next year’s bees. Harvest their cocoons in the fall, store in a small box in your fridge, and you will have a guaranteed healthy generation of bees for the next pollination season. Hole-nesting bees have the added advantage of not flying far for forage. Their range is about 300 feet, which means that wherever your garden is located the bees will stay nearby to gather pollen and nectar. There are some things to consider when raising mason and leafcutter bees in an urban setting. They need morning sun for energy to start flying. 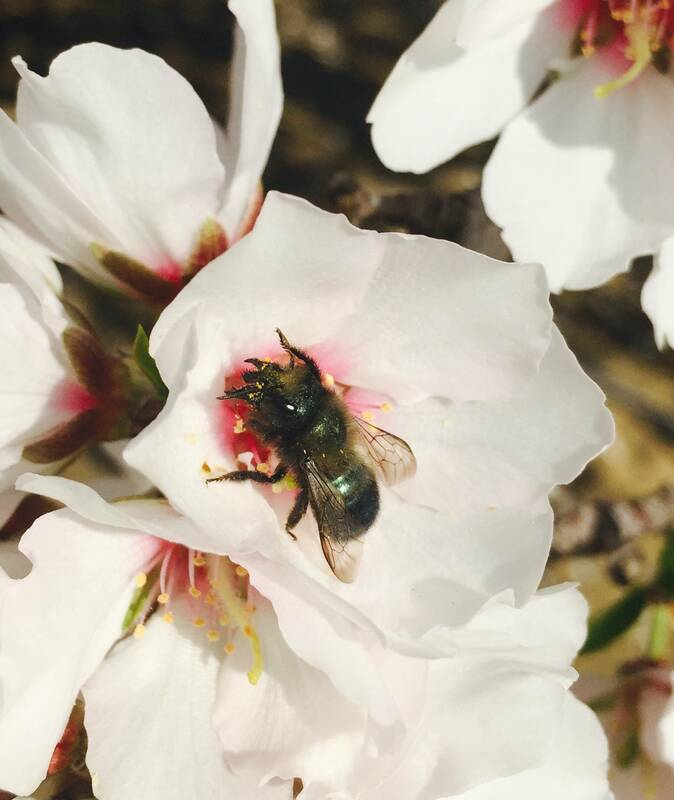 A rooftop garden’s temperature could be warmer than a mason bee would like (they are spring bees that emerge when weather is about 55 degrees). The bees also need warmth in the afternoon; too much shade could leave them lethargic. A rooftop garden may be too windy at times and the nesting house should also be carefully placed for protection. Nesting material for building egg chamber partitions is important as well. Mason bees need clayey mud and leafcutter bees use small pieces of soft-celled leaves for building nesting chambers. Mason and leafcutter bees are easy-to-raise, cheaper than honey bees, safe, and fun. When we use them, we improve ecological health and diversity by reintroducing a native species and providing attractive habitat that other hole-nesting insects also will appreciate. This entry was posted in Biodiversity, Urban Agriculture and Food Policy, Wildlife. Bookmark the permalink.